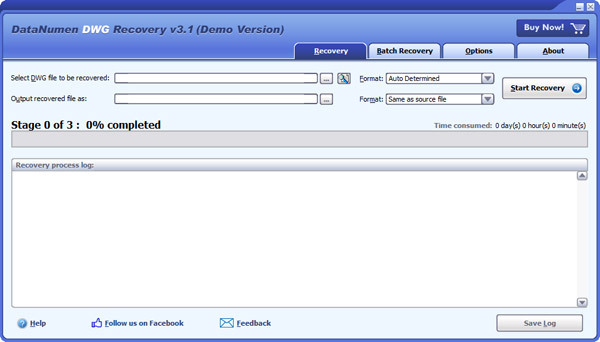 DataNumen DWG Recovery (DDWGR) is a powerful tool to repair and recover corrupt AutoCAD DWG files. It can scan the DWG files, then recover your data in them as much as possible, so to minimize the loss in file corruption. – Support to recover AutoCAD R14 to 2017 DWG files. BLOCK, POINT, LINE, ARC, CIRCLE, ELLIPSE, SPLINE, XLINE, RAY, SOLID, 3DFACE, LWPOLYLINE, POLYLINE (2D), POLYLINE (3D), POLYLINE (PFACE), POLYLINE (MESH), VERTEX (2D), VERTEX (3D), VERTEX (MESH), VERTEX (PFACE), VERTEX (PFACE FACE), TEXT, MTEXT, TRACE, ATTRIB, ATTDEF, ENDBLK, SEQEND, INSERT, DIMENSION (ORDINATE), DIMENSION (LINEAR), DIMENSION (ALIGNED), DIMENSION (ANG 3-Pt), DIMENSION (ANG 2-Ln), DIMENSION (RADIUS), DIMENSION (DIAMETER), LEADER, TOLERANCE, BLOCK CONTROL OBJ, BLOCK HEADER, LAYER CONTROL OBJ, LAYER, STYLE CONTROL OBJ, STYLE, LTYPE CONTROL OBJ, LTYPE, VIEW CONTROL OBJ , VIEW, UCS CONTROL OBJ, UCS, VPORT CONTROL OBJ, VPORT, APPID CONTROL OBJ, APPID, DIMSTYLE CONTROL OBJ, DIMSTYLE. – Support to recover lost & found objects in DWG files. – Support to recover deleted objects in DWG files. – Support to output fixed file in DWG format and DXF format. – Support to output fixed file in AutoCAD R14 to 2017 format. – Support to repair DWG files on corrupted media, such as floppy disks, Zip disks, CDROMs, etc. – Support to repair a batch of DWG files. – Support to find and select the DWG files to be repaired on the local computer. – Support integration with Windows Explorer, so you can repair an AutoCAD DWG file with the context menu of Windows Explorer easily. – Support drag & drop operation. – Support command line parameters.